I love all animals. I even love insects and arachnids. I don’t love to cuddle with all of them or even get close enough to touch them, but I have an appreciation and affinity for all creatures. I am not really a horse person. I know many people who are and they speak convincingly of the relationship and connection they have with their horse. While I find them magnificently beautiful and powerful I also see them as a little unpredictable and intimidating. And they are big. I teach a private yoga lesson to someone who lives in the secret country – a little pocket of intersecting dirt roads and acreage for livestock and remnants of orange groves – off a very busy city street. I always bring my camera. I have seen hawks just a few feet from me, bunnies crossing the road, goats, cows, turtles, donkeys, a giant pig, tiny horses and on occasion, in the distance, this beauty. On my way out of this little oasis of country, I stopped at the end of one of these dirt roads to take a picture of a fence post – doesn’t everyone? I got out of my car to catch the light on the little flowers when I heard a noise from across the street. It was stomping. I looked up and this horse was pressed against the fence stomping his foot to get my attention. Once he had it he started using his head to call me over. He would scratch his giant jowls and neck on the top of the fence then move his head in such a way that I knew he was motioning me to come see him. He would dip his head inside and below the fence, turning it a little this way and that, then stop to look at me. Did I understand? It was so unexpected that I had to obey. With my car running and the door open in the middle of the road I walked across the street. He looked at me and rubbed his face on the fence again then nodded. I held my hand out like he was the biggest dog I’d ever seen so he could sniff it. I have no idea if this works with horses but it was my only instinct. He seemed to accept my scent so I placed my flat hand on the broad part of his nose just under his eyes. I lightly patted it and brushed my hand with the grain of his fur. We looked at each other. There was a mutual recognition of power that we agreed was unnecessary to assert on one another. This was not about control, it was about connection. I scratched his neck and face where he’d been rubbing it. We had some sort of conversation that seemed to last for hours. I thanked him for posing for a few pictures and being so sweet, laid my hand on his nose again and said good-bye. I wanted to back away. I was so mesmerized by him. He watched me leave. As I got in my car to drive away I glanced back up at him. He was still looking at me. His eyes followed me and my car until I was out of sight. The whole experience was so mystical. This was two days ago and as I write this my body is readily conjuring those feelings of awe and what I can only describe as love I felt during our exchange. 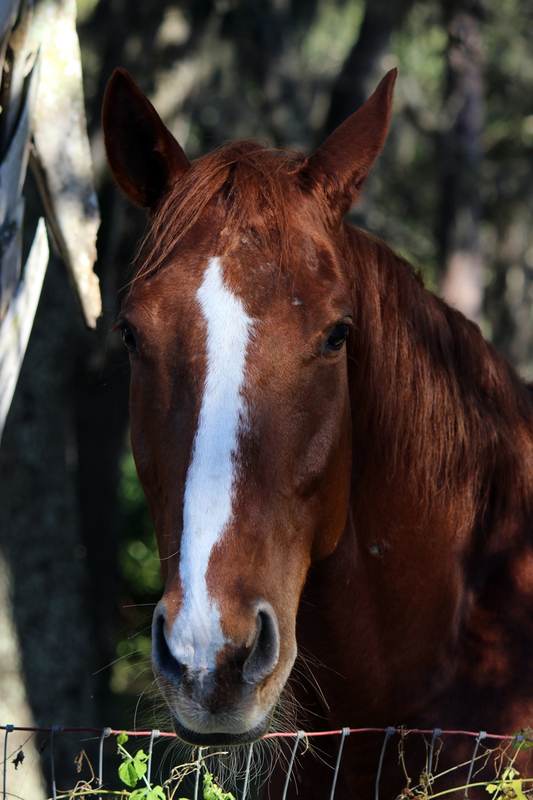 I have been around many horses, usually at a respectable distance, usually with someone who is a “horse person.” I have ridden a few, but never really felt comfortable. But this one, he was special. We had a moment. I get it now.